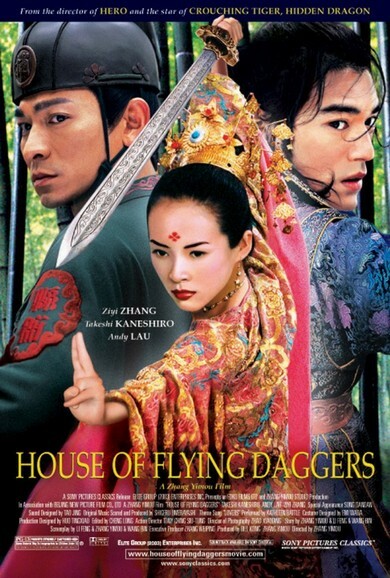 Story: "House of Flying Daggers" is set in the year is 859AD as China's once flourishing Tang Dynasty is in decline. Unrest is raging throughout the land, and the corrupt government is locked in battle with rebel armies that are forming in protest. The largest, and most prestigious of these is the "House of Flying Daggers", which is growing ever more powerful under a mysterious new leader. Two local captains, Leo (Lau) and Jin (Kaneshiro) are ordered to capture the new leader and the two hatch an elaborate plan. Captain Jin will pretend to be a lone warrior called Wind and rescue the beautiful, blind revolutionary Mei (Ziyi), from prison, earning her trust and escorting her to the secret headquarters of the House of Flying Daggers. The plan works, but to their surprise, Jin and Mei fall deeply in love on their long journey to the House. Danger lurks in the forest surrounding them, and the wind is still, as if sensing the tension in the air. What lies ahead for Jin and Mei, these star-crossed lovers? If this is true love, then why are there plots in their heads, and secrets in their hearts?